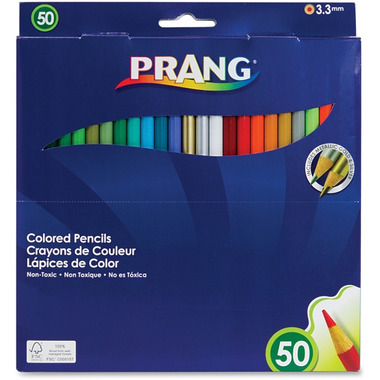 Prang Coloured Pencils offer great colour for the student artist. The pre-sharpened pencils are ready to use and the real wood casings result in easy sharpening every time. Pencils have 3.3mm cores. These pencils come in an extensive range of colours including silver, gold and a few neons. I am satisfied with their performance overall although I have had a lot of breakage while sharpening but that could be my sharpener(?). Good quality pencils in an impressive line-up of colours including gold, silver and a few neons. Really enjoying my "Adult Coloring Books" now that I have so many colours to choose from!